Thanks to Goose Creek Rocks, I have been inspired to make rock art! Here are some of the rocks I've made as gifts for my friends and family, as well as the rocks I've donated to the community. I also give you a few hints about making similar work of your own. This rock is a companion piece to the Moon rock pictured below. You can get a really cool "stamped on" effect with the drawing by using a sharpie and stippling on the lines. For the colors, I used acrylic ink. Then, I sealed it all over with a varnish sealant. Shiny! This piece was made similarly to the sun rock, just sharpies and acrylic inks on bare rock. 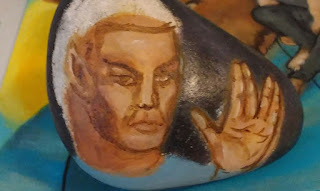 This lovely Spock Rock was a gift for my Trekkie boyfriend. It was done with acrylic ink and acrylic paint. I included a progress shot to illustrate how I built up the layers to get those nice juicy colors. I'm especially proud of the inky space background, the details of which were unfortunately a little too shiny to pick up with the camera. the background and then blocking in the foreground details. backwith the ink and got the sharp details in. 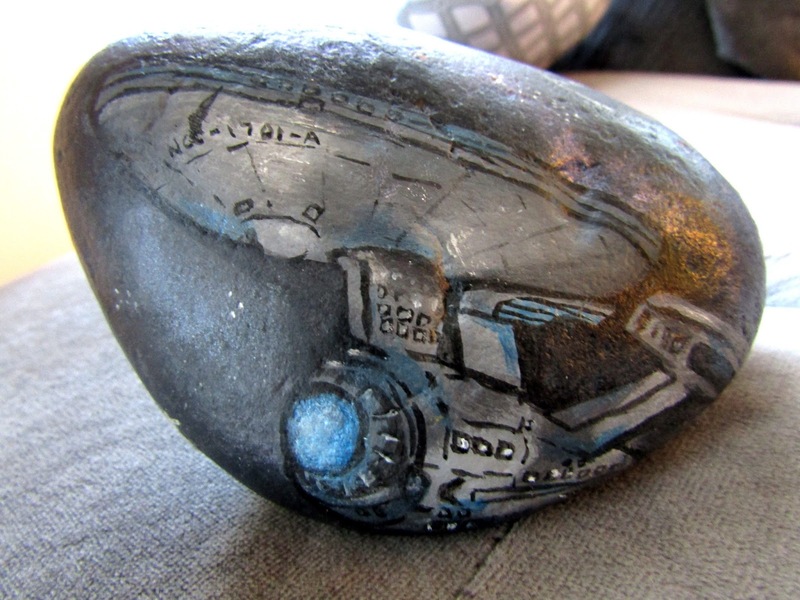 Unlike the sun and moon rock, Spock Rock was made heavy with paint. I think that was ultimately the reason why I was unable to paint varnish over top of this one... My theory is, the acrylic ink wasn't absorbing into the rock enough because it was sitting on top of plastic based acrylic paints. The varnish just lifted and pushed the ink around instead of properly sealing... luckily, I only did this in a test corner and didn't continue on the rest of the piece! Check out the other sides of this painted rock. I'm low key psyched about managing to at least somewhat pull off the Enterprise part. Technical and geometric drawings are definitely not my forte, I'm more into organic shapes myself. I used shiny blue paint to give it that spacey glow. I suppose this was inspired by the reboot Star Trek movies and all their lens flares. This squiggly little octopus was done for my friend Racheal who absolutely loves anything to do with tentacles. This one was fun to do, just layering dots on top of dots. The stippling effect looks really neat on rock art in my opinion. You can get some good color values and the dots seem to look a little more natural than just smooth lines for some reason. All I did here was build up various colors of sharpie to get a desirable level of color and shading. And since they're permanent markers, you don't have to worry about them smearing with varnish- if you decide to put varnish on at all at this point. Using Sharpies is a good way to cut out the sealing step altogether. I decided to go ahead and varnish anyways, it couldn't hurt right? Since we're on the subject of beachy things, here's a few of my "Broken Ocean Series" rocks that I made for the Goose Creek Rocks community. I was interested in using the three dimensional nature of "broken" rocks to add an extra depth to the scenes. Check out this sweet fishie! The rock's shape did all the talking and I just painted in the details and drew the lines with sharpie. Another example of using a rock's shape to dictate the design painted on it. In this case, I couldn't stop thinking of this rock's shape to be very "pumpkin like." I love the level of control and detail you can get with a simple fine point sharpie marker. I think these are the funnest rocks to decorate. Mess free and more control over details, what could be more ideal? This was inspired by a similar series done by another artist, but I can't find the source! These are some of my favorites. I hid one of them inside one of those quarter toy machines and I snuck one of them behind the bar at Starbuck's to add a little spontaneity to the lives of the busy baristas. These were done in straight up acrylic paint, no tricks here. When in doubt, paint an eyeball! This was a silly and simple one but I think it's one of my favorites. There is just something charming about his creepy little expression. I got my hands on some paint markers and they work like a dream on rocks! I was very happy with how the colors turned out on this one. The ink is oil based which makes it pretty darn permanent to boot. One day, me and my parents snuck over to my cousin's house and hid rocks for them all to find. 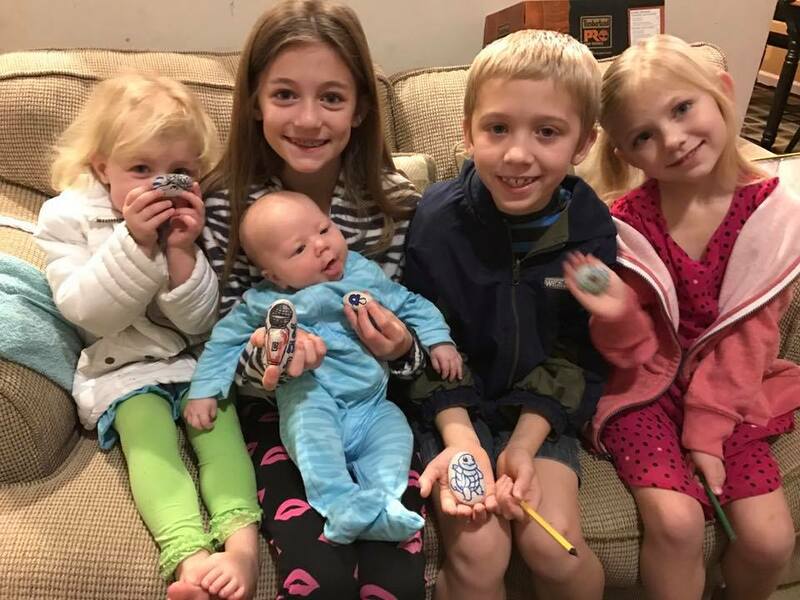 Here's a pic of the happy hunters after discovering their specially made rocks! Do you make rock art, or are you a part of a rock hiding community? Feel free to toot your own horn in the comments below. I think it's a beautiful and unique medium to work in and I'd love to see more of it. Also, if you want to paint some rocks of your own but don't know where to start, make sure to check out my massive tutorial I made about rock art here. I compiled some good info there, hopefully it will be of use to you. Until next time!